Nissin Fine Mode Kosansui 320!!!!! I have to admit, I love this series of rods! I own both the 270 and the 320, have the 360 on order, and am about to buy a 390. IMO this series is the best bang for your buck in lightness, sensitivity, and fish fighting power. 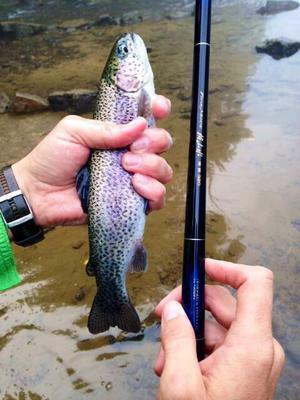 They are a tip flex rod, but the tip is light and casting is accurate. I recently took the 320 to Arkansas and it flat out performed. 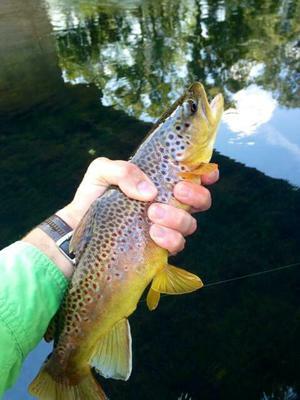 Took many trout including these bruisers in the photos. I now own quite a few tenkara style rods including the expensive one. I still find that it's hard for me to put these down. I have said it once and will repeat myself, "this series is a MUST buy in my book!" Comments for Nissin Fine Mode Kosansui 320!!!!! Hey Jeff, liked your post and pics! 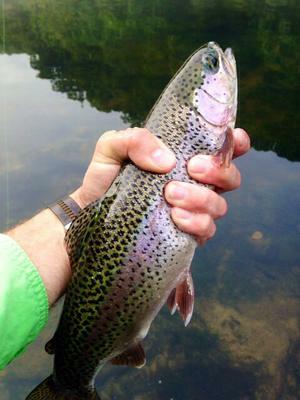 Where in Tyler, TX did you find a place to fish for trout or was it someplace else? I was on a trip to Arkansas. Only trout we get in Texas are the stockers in the winter.